Cleaning the oven is a time consuming task, but now cooker manufacturer, Beko, have provided a solution to help kiss those days of elbow grease goodbye with the launch of the "Programme Clean" Oven (OIM22500XP). This stylish built-in model includes two programmed cleaning options to save you from the dreaded chore and those intoxicating oven cleaner fumes. With 12 cooking functions, the new Beko "Programme Clean" Oven provides various cooking methods, including static, grill and fan. It is available in stainless steel and provides a simple approach to cleaning the oven, using extreme heat to oxidise the dirt. There are two cleaning functions to clean the oven interior, including a programme for lightly soiled ovens, as well as those with tough burnt on spillages. Any burnt-on dirt is carbonized and simply turned to ash which can be easily swept away at the end of the cleaning cycle, allowing you to keep your oven in pristine condition. The multifunction 60cm oven has a large 65L capacity, slotting perfectly into the modern kitchen and is a welcome extension to the successful Beko Built-in range launched last year. 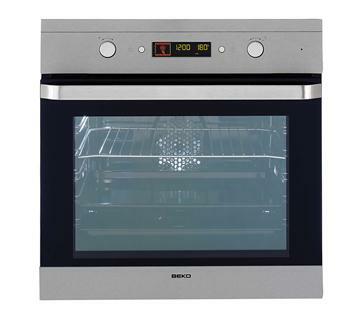 As well as the simple cleaning programmes and four layer glass door to ensure a cool outside surface, the new "A" rated Beko oven also boasts many other features, including a large display fully programmable LED timer, telescopic shelf system, large viewing window, interior light and fingerprint resistant stainless steel finish with a removable oven door to assist door cleaning. The Beko Built-in range of cooking, cooling and home laundry appliances has been developed to provide a stylish combination of durability, reliability and affordability; continuing their commitment to offering high quality products packed with practical features to meet the constantly changing needs of the busy household.